Wherever you live in Queens or Long Island, and across America, it's worth noting that there's always a chance that you'll find yourself searching for the help of a divorce attorney or child custody lawyer. While we often prefer not to think about issues like family law dynamics and stressful relationships, the truth is that many people find themselves in need of family law help at some point during their lives. Whether you're concerned with issues of maintenance, child support, or even parenting and visitation rights, it can help to know that there's a professional nearby who you can rely on to represent your best interests in all aspects of family law. Even in New York, where "no fault" divorces are a reality, many couples find the concept of divorce and child custody arguments to be highly complex. Fortunately, with the assistance of Mr. Darren M. Shapiro, a conveniently located professional in family law, you will have someone that wants to make your experience as simple and painless as possible, without compromising your rights. Mr. Darren M. Shapiro has almost two decades of experience working as a lawyer and has focused on matrimonial and family law in New York and Long Island since he opened his own office in 2005. That means that you can rest assured that you're working with a divorce lawyer who can defend your interests every step of the way. Mr. Shapiro will answer any questions that you might have about your legal process, and help you to better understand the routes that are available to you, from collaborative law, to mediation to litigation. According to information taken from Wikipedia.com, Forest Hills is a stunning residential location in the borough of Queens that was originally known as "Whitepot". Based on data from the 2010 census, there are currently 86,364 people living there. Of that significant number, it's worth noting that at least some will require the assistance of a child custody lawyer or divorce attorney. Luckily for residents of Forest Hills, Mr. Shapiro is nearby and ready to help. The issue of divorce is something that raises many concerns for different people. Though it's fair to say that divorce is a difficult and emotional experience, the help of the right divorce lawyer can help to minimize the issues that you encounter during your legal case. Mr. Shapiro can help you to better understand the details of the divorce procedure, as well as the nuances of the different courts that you may visit. If you and your ex-spouse are both mutually agreeing to the need for a divorce, then you could even consider using alternative methods to litigation. As a highly-experienced divorce attorney, Mr. Shapiro is also a trained mediator and collaborative lawyer. Both mediation and collaborative law are legal options that allow individuals to approach the issue of divorce, and other cases from an angle that favors mutual negotiation. Mediation can even help couples to discuss essential aspects of dissolving a marriage, such as maintenance, child custody, and equitable distribution. 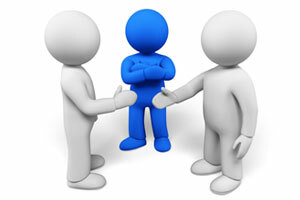 In fact, mediation is often faster, and less expensive than other routes such as litigation. Ever since Mr. Shapiro was admitted to the New York bar in 1999, he has worked tirelessly alongside clients from a range of different backgrounds. As a child custody lawyer and experience in divorce attorney, he uses his knowledge of the local courts, with a welcoming attitude to assist and reassure his clients throughout each aspect of their case. Even if residents of Forest Hills are unsure about which route they want to take for the divorce process, Mr. Shapiro can give insights into the options available, and help to simplify the process as much as possible. As a local family law lawyer for Queens and Forest Hills, Mr. Darren M. Shapiro is an experienced divorce attorney, family lawyer and a dedicated child custody lawyer. Mr. Shapiro's knowledge ensures that he can try his best to help clients from all backgrounds to come to terms about crucial choices that must be made in the best interests of a child during a divorce case. For instance, he might provide guidance into the negotiations that take place during child support agreements, or assist in parenting time agreements, visitation rights, and other elements of child custody. With mediation, Mr. Shapiro is a neutral that draw on his experience as a divorce attorney and child custody lawyer that helps residents of Forest Hills to become better acquainted with the different solutions available for parenting time, such as joint or sole custody. Importantly, there's often a great deal more to custody agreements than simply figuring out where a child will live. Concerns that might be addressed by both parents range all the way from schedules for visitation, to who should have the right to make decisions on the behalf of the child when it comes to education, health, and even religion. Mr. Darren M. Shapiro has carefully built upon his skills as a child support lawyer, child custody attorney and divorce lawyer over the years, to do his best to try to give all his clients the best quality of care. From his practice within Nassau County, Long Island conveniently located on Jericho Turnpike; Mr. Shapiro is only a short drive away for residents of Forest Hills that need to consider their options when it comes to taking the next step in family law. No matter the circumstances, Mr. Shapiro will always work to serve the best interests of you, and what you want for your children. Potential clients who want to discuss the different options available are encouraged to schedule an appointment or get in touch with Mr. Shapiro to discuss the unique aspects of their case. Regardless of whether you're searching for help with divorce, child custody or other family law matter, Mr. Shapiro can guide you through your case with professionalism and care. You can contact him today either via our online form, or connect over the phone at (516) 333-6555 to arrange your initial, free half hour appointment at a time that suits you best.